Rod discoloration, heater block tilting... Aaaah! Posted November 7, 2015 · Rod discoloration, heater block tilting... Aaaah! 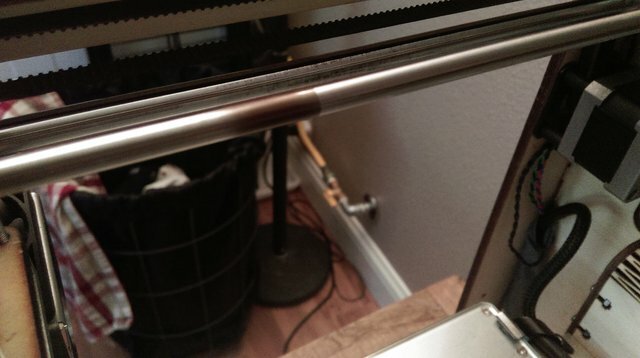 I'm just going to get right into it: First problem: the rods are discolored in two spots on the x-y carriage of the printer, and in those spots, the carriage slows down just a bit. 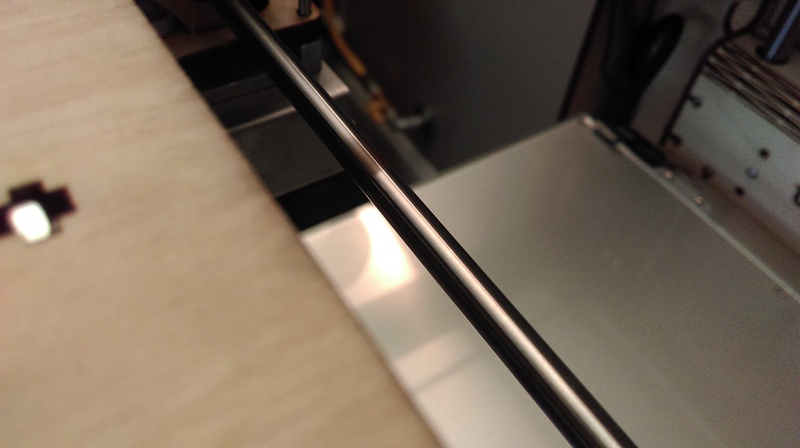 Not enough to cause defects in my prints - just enough to catch it up when I move the head manually when doing maintainance. Pretty worrying stuff. 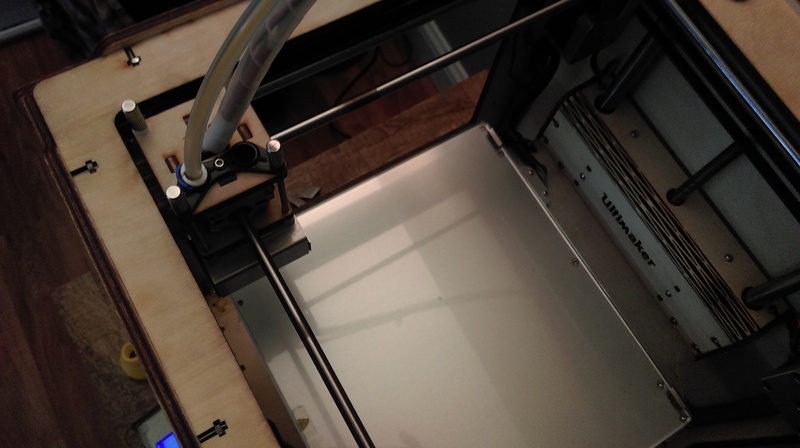 The problem arose after a failed print. 26 hours in, I ran out of the ColorFabb PLA/PHA I was using, and decided to use the "Change Filament" option to swap it out with some other PLA I had lying around. 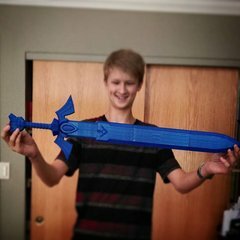 Sadly, it wouldn't extrude, and I was left with a 99% complete print. When I turned it off, I moved the head to the back-right corner like I usually do, and noticed that the spot that the head had stopped at during the print had been covered in a layer of black... stuff. Not exactly sure what it is, but it's there. Aaaah! Next problem: my heater block is tilting! Not sure how or why it happened, but I just noticed it after printing out a smaller profile fan shroud for use with E3D nozzles. 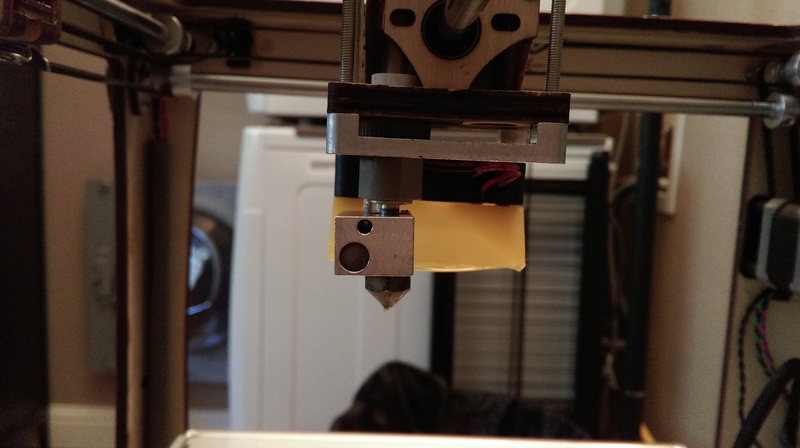 The last time I had replaced the nozzle, the block was fine - now it's ever so slightly tilted towards the front left corner of the printer. 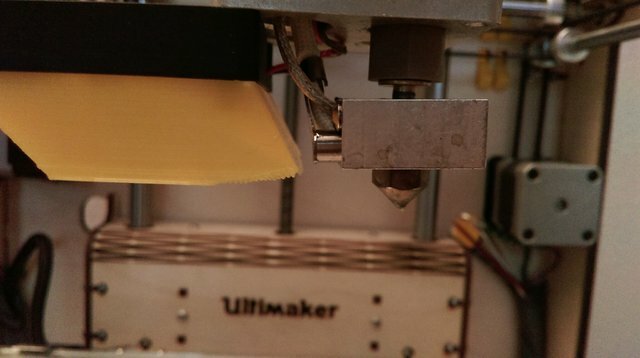 So far, this hasn't caused any trouble in printing, but it's still pretty worrying. Just posting it here to see if anyone else has had a similar issue. Posted November 8, 2015 · Rod discoloration, heater block tilting... Aaaah! The black areas on the rods are from not enough lubricant. You need to regularly lube them with a drop of sewing machine oil. If you hold the nozzle and are able to tilt the block back and forth by hand then I would think that the thread in the Heater Block would be damaged. If it's firm but still bent then I would think the Isolator Tube is bent. Both can be brought from the store in provided links. Posted November 11, 2015 · Rod discoloration, heater block tilting... Aaaah!